BC’s largest construction bidding marketplace. Join over 10,000 companies. Whether you’re sourcing bids or looking for projects, BidCentral is your one-stop shop for all construction project opportunities. Browse for pre-bid, public and private project opportunities using advanced search tools, opportunity matching, and automated notifications when new projects are posted. 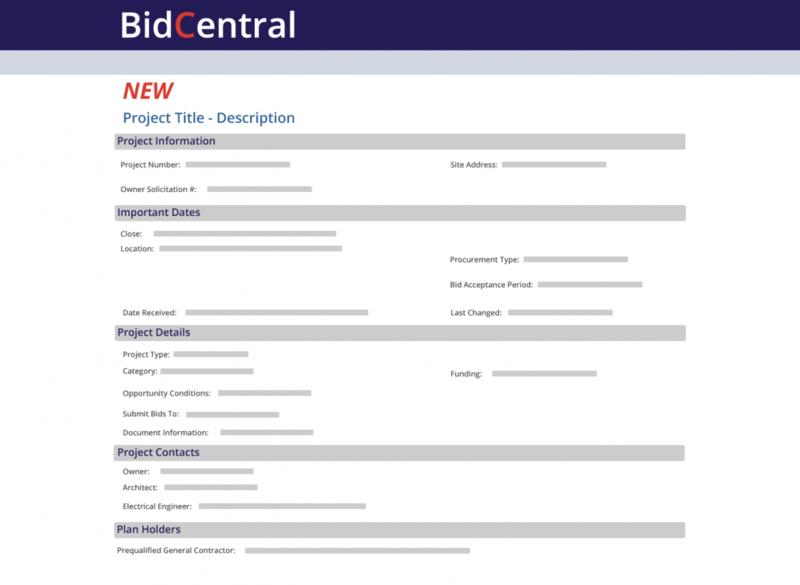 With BidCentral you’ll never run out of projects to bid on. Gain insight into current, future and awarded bidding opportunities with quick and easy access to accurate, complete project information and documents. View the categorized documents, download, print and order the plans you need when you need them. Subscribe to keep track of projects, stay ahead of deadlines through instant notifications of addenda, site meeting and project updates. Keep track of important to-do’s with our built-in reminder system. Get new project opportunities delivered right to your inbox when projects that match your keywords get posted. No need to keep checking for new projects with this handy feature that emails you daily for new projects in your region or those that suit your specifications. John KnappettPresident, Knappett Projects Inc.
Be part of BC’s largest construction marketplace.